I am sure that if you have followed my blog before, you will be well aware that I hoard foundations like they are going out of fashion. I don’t know what it is about foundations that I adore so much, but I just seem to collect them and every time a new one goes onto the market, I have to try it out immediately. When I am applying my makeup, I always aim to make my base makeup as flawless and perfected as possible and I tend to neglect other areas like my eyes and lips. I just think that you cannot go wrong with a beautiful base and simple makeup, it is a timeless look and that is why I am on the hunt for the most perfect foundation. So, my foundation of choice over the past week to trial has been the Giorgio Armani Luminous Silk Foundation. I am sure that you will have heard of this foundation before because of the likes of the Kardashians who made this foundation soar to popularity. 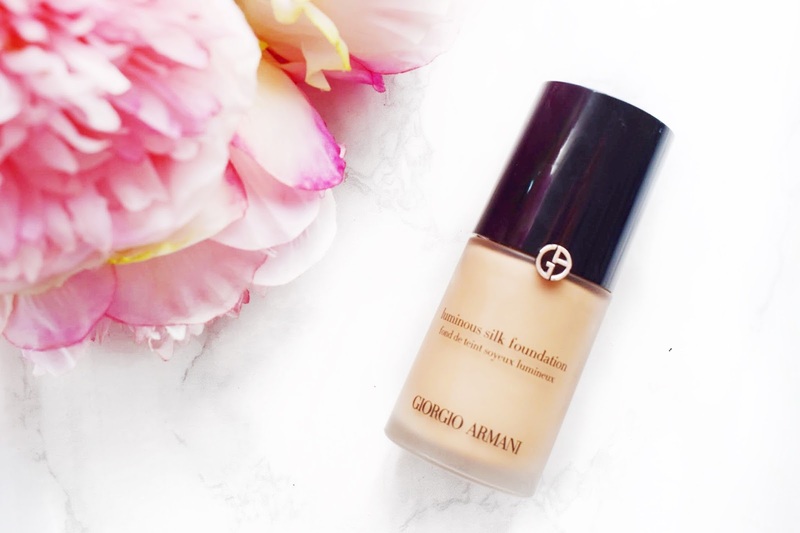 Since then, it has become a favourite of so many different beauty bloggers and YouTubers, so I really had to get my hands on this Giorgio Armani Foundation and give it a try for myself. This has very quickly become a firm favourite of mine and I rank it very highly up there with my Chanel Perfection Lumiere and my Marc Jacobs Remarcable Foundation. 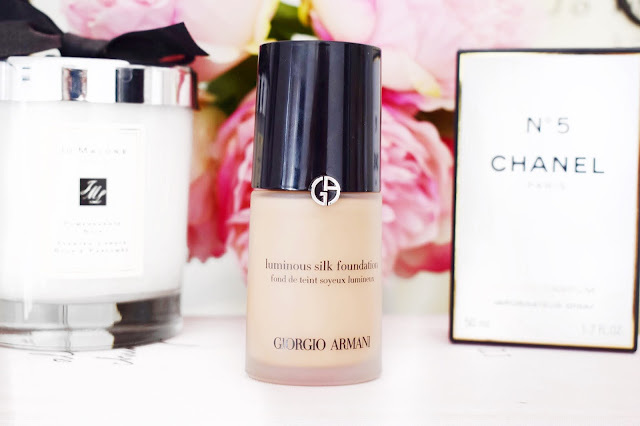 Even though this Giorgio Armani Luminous Silk Foundation has been on my wish list for such a long time, there was one thing that stopped me from buying it sooner and that was the word ‘luminous’ in the title. As somebody with an oily complexion, I tend to stay away from foundations with words like ‘glowing’ and ‘luminous’ in the title because they tend to just make me look like an oily mess. But, I couldn’t deny that whenever I saw somebody using this foundation that their skin looked incredible, so curiosity got the better of me and I just ended up going for it and trying this out for myself. Before anything else, I want to talk to you guys about the packaging of this Giorgio Armani Luminous Silk Foundation. When I opened this foundation, I was immediately in love with how it looked. When I am paying almost £40 for a foundation, I want the packaging to reflect the price point that I am paying, and I think that this foundation does that perfectly. The frosted glass bottle is just stunning, and I love that it comes with a pump and a cap on top. It is very similar to the Chanel Foundation bottle and I am sure that you are all well aware that I adore everything about that product. I bought the shade 8 in this foundation and I have to admit that I think it is the most perfect shade for my skin tone. When I apply it, I can see the beautiful olive shade of the foundation and that is exactly what I need. I will say that when I was trying to find my shade I did find it pretty difficult because it isn’t the largest shade range that I have ever seen, but at the same time, it is still more inclusive than other brands out there on the market. I do find that this foundation can go a little redder throughout the day, but it isn’t anything overly noticeable and nothing that can affect the look of your makeup significantly. In this bottle of foundation, you get 30ml of product, which is a standard amount of product for a liquid foundation. I know that some people won’t be interested in knowing about things like that, but when I am paying for a high-end product, I at least want it to be the standard amount which most brands opt for. I just thought that I would mention it because I was sorely disappointed when I checked my Marc Jacobs Remarcable Foundation and I realised that it is only 22ml of product. Like I said, I know that it isn’t a big deal, but it is something that I think is worth mentioning. Now, I want to talk about the consistency of this product and how it applies to the skin. When I pump this Giorgio Armani Foundation onto the back of my hand it is a very thin and lightweight feeling foundation. I then go in with my Morphe M439 Buffing Brush and I blend it into my skin. I feel like when I apply it in this method it blends into the skin within an instant and it takes next to no effort. I would say that the consistency is very similar to the Koh Gen Do Aqua Foundation which has been a favourite of mine for a long time now. I have also tried to apply this with a damp Beauty Blender, but I found that it did seem to absorb a fair amount of product. Now, I want to talk about the level of coverage. I have explained in other posts before that I do have areas on my face that I have to cover, like my freckles, darkness or hyperpigmentation. When I first swatched this I wasn’t sure if it would manage to hide everything because it is so lovely and lightweight. But, with just two pumps of this foundation, it covers my whole face and even allows me enough product to go back in with a touch more product in the areas where I need it. With that, I am left with a full coverage finish and my skin looks very beautiful and I am left with a full coverage finish. One thing that I feel like I should mention about this Giorgio Armani Luminous Silk Foundation is that it does have a strong scent to it. It is quite similar in that respect to the YSL Touché Éclat Foundation. I personally find the smell really nice and once it is on the face the smell does fade and once the skin has been set with a translucent powder it becomes barely noticeable. But it is fragranced so that is something to bear in mind if you have sensitive skin because I know my sister for one really wouldn’t get along with this foundation for this reason alone. Now for the luminosity and my oily skin. I tend to get oily predominantly around my nose. I have to powder throughout the day with more or less all foundations even if they claim to be matte. With this been a naturally glowy and luminous foundation I did worry that I would look like an oil slick. However, that hasn’t been the case. I have been touching up once in an afternoon and other than that the foundation holds up really well. I would say if you are mildly oil like me the Giorgio Armani Luminous Silk is good for your skin type and it will work well. I find that the foundation just gives the most stunning, healthy glow to the skin, without making you oily or greasy. Now for the big question, would I repurchase this foundation? And the simple answer to that question is a resounding yes. Without a shadow of a doubt I would. It is a such a good foundation and I recommend that everybody gives this a go, even if you just get a sample because I can guarantee that you will love it. I will leave a link to this foundation down below in case anybody wants to check it out for themselves. Make sure to leave me a comment and let me know if you have tried this foundation and what you thought about it.